Coffee drinkers and brewers everywhere know that a key to making quality coffee is how you grind it. There is no point in having the best coffee makers if you’re not getting a good grind of the beans. That’s why you, the knowledgeable coffee drinker, are looking to find the best burr coffee grinder for your budget. The first thing you need to know, however, is the difference between the wheel burr grinders and conical burr grinders. The difference is small, but may be important to your decision making process. Wheel burrs tend to be both noisier and messier than their conical counterpart, making the morning coffee process potentially annoying and long. So if you can afford it, consider the best conical burr coffee grinder. That way, the whole house stays asleep. Below you will find a list of some of the best burr coffee grinders that can be purchased online. While some carry heavier price-tags than others, it all depends on what you are looking for. Portable or counter-friendly, the choice is yours. With over three thousand customer reviews, this grinder comes with plenty of feedback to bolster your decision. This is a 100-watt conical burr grinder that comes with 16 different settings. The bean container on top can hold up to 8 1/2 ounces of beans, with the lower grounds container holding up to 4 ounces. With the slowest grinding speed in this class of grinders, the Capresso 560.01 can create excellent flavor with minimal static. It has a 5-second to 60-second timer and comes with a cleaning brush and measuring scoop. This automatic grinder shuts off when it has completed the job, making it an easy and relatively hands-off endeavor to prepare your coffee beans in the morning. 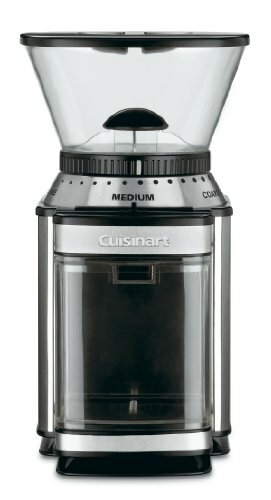 The Cuisinart DBM-8 has 18 different grind settings with 6 settings per grind type, and it is suitable for those who enjoy various styles of coffee. The 8-ounce bean hopper located on top is removable while the grind chamber has enough space for 32 cups of coffee. All of the parts of this grinder that can be removed can also be placed in the dishwasher for easy washing. 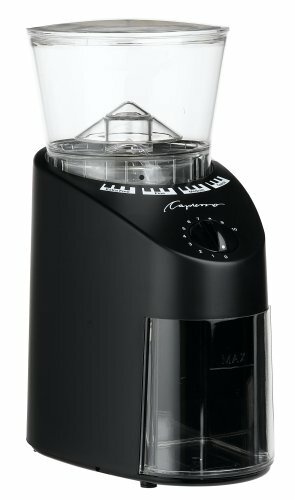 Similar to the Cuisinart DBM-8, this grinder also has 18 grind settings and a removable hopper that can hold up to a half pound. The grinder has sensors installed to make sure that both the bean and ground containers are installed correctly before it will begin to grind. A benefit of this grinder is the price tag, which is comparatively lower than many other competitive brands and grinders. If you are looking for a burr coffee grinder that provides you with an ample amount of options, try the KRUPS GX5000. This grinder gives 45 different settings on 9 steps, offering coffee types from finely ground espresso beans to coarsely ground French press. This product comes with a 2-year warranty. You can select between two and twelve cups and the grinder will automatically stop once it has completed the selected amount. 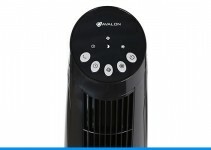 It comes with a cleaning brush and has a removable stainless steel burr for easy access. 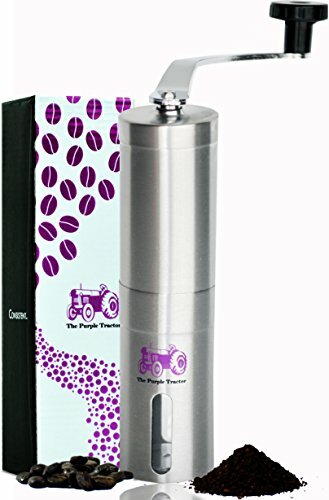 This portable version of countertop burr grinders is a small and lightweight carry-along for coffee lovers. User-friendly and designed for on-the-go use, the Hario Coffee mill uses ceramic conical burrs to grind the beans to your desired setting. 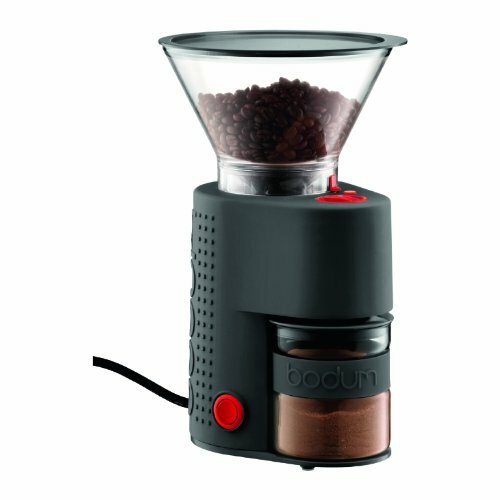 This grinder is very easy to clean and makes excellent tasting and even coffee grounds. The grinder top even fits on regular-mouthed Mason jars to make grinding and storing a breeze. 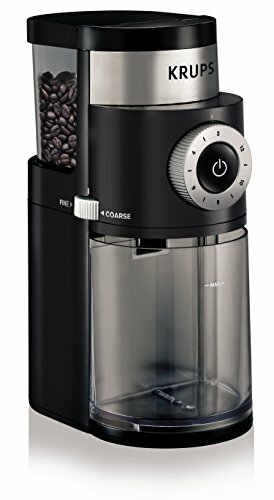 This burr coffee grinder sports an adjustable burr grinder and over 14 settings. Able to come in many different colors, including black, orange, red, green, and white, the Bodum Bistro will fit in seamlessly with your kitchen’s design. The receiving container is made of glass and eliminates that annoying static cling that coffee grounds commonly have. 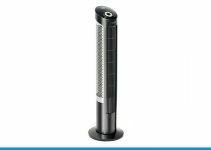 The conical burrs are located within a sturdy nylon body, keeping the grinder from breaking easily. This grinder also has a handy timer to make sure you get the perfect amount every time. 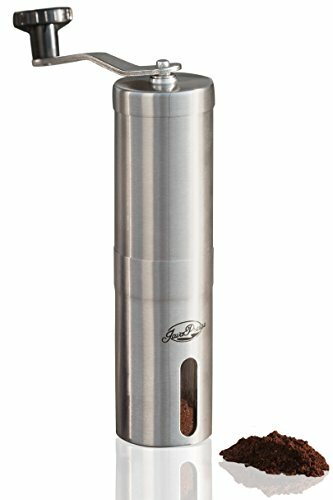 Another manual burr coffee grinder, the JavaPresse Grinder is an excellent option for campers seeking a great tasting morning coffee. It comes with multiple settings, allowing the user to grind for pour-over, cold brew, French press, and more. 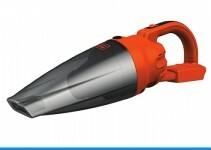 By using the hand crank method, you will find that this grinder is nearly noise-free. This grinder incorporates long-lasting ceramic burrs and can be split into multiple pieces to fit in luggage or tight areas. Made of brushed stainless steel, it is easy to clean and professionally built. The company that makes this product also offers a Lifetime Money-Back Guarantee. 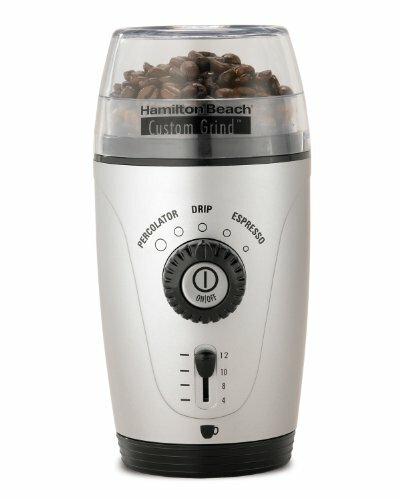 For a burr coffee grinder that is easier on the wallet, try the Hamilton Beach Hands-Free Coffee Grinder. The grinding chamber on top is easy to remove and safe to be washed in the dishwasher. This grinder can be used for spices as well as coffee beans, and it has a hidden storage area for the cord, keeping your countertop uncluttered. It can make up to 12 cups of coffee with each full chamber. This inexpensive grinder comes with 5 preset options for finely to coarsely ground beans and shuts off on it’s own once the job is completed. 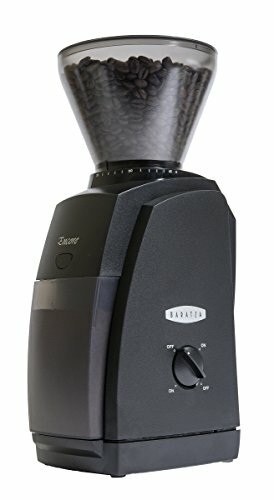 When seeking a burr coffee grinder that comes with multiple settings, you might want to try the Baratza Encore. Coming with 40 individual grind settings, it can be used by coffee enthusiasts who enjoy Aeropress, Siphon, or Chemex brewing methods. This grinder incorporates a slower RPM with an excellent DC motor to make sure you not only have static-free coffee grounds, but that the process to get there involved as little heat as possible. A button on the front of the grinder lets the user make as much or as little as they want. The hopper can hold up to 8 ounces of beans, and the bottom container can hold 5 ounces. This affordable hand coffee grinder comes in stainless steel. The trademark purple tractor icon rests above a clear window which denotes the collection container. The ceramic conical burr is highly adjustable, allowing the user to make anything from fine espresso grounds to course French press. Portable, easy to clean, and lightweight, coffee lovers can use this in the office or out in a tent. This manual grinder is sturdy and comes with a Lifetime Money-Back Guarantee. 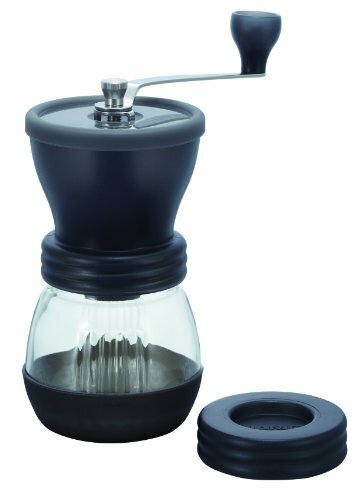 These easy to find grinders allow you to drink fresh coffee while camping, working away from home, or waking up in the morning. All of these options can be found on Amazon and are accompanied by reviewers testifying the quality of coffee that they receive each day. Whatever your need, there is one of the best burr coffee grinders waiting for you.